A New Leaf Tree Service - For all your tree, shrub, hedge and stump needs. 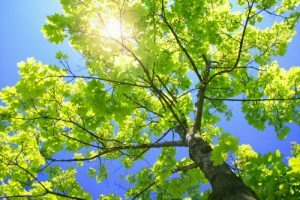 A New Leaf Tree Services is a year-round, fully insured tree services company providing quality tree care and treatment to Southeastern Wisconsin, with its primary focus being on Waukesha & Milwaukee Counties. We are centrally located in Sussex. As the owner of a previous award-winning tree service, the owner is very knowledgeable and experienced in the tree service field. 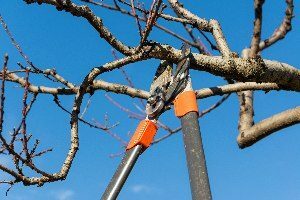 A New Leaf Tree Service has certified arborists who specialize in tree services including tree trimming, tree pruning, tree removal, removal of hazardous limbs, stump removal, stump grinding, shrub pruning & shrub removal. 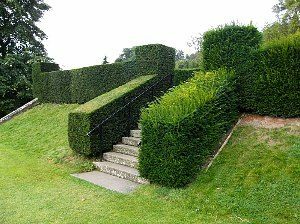 We also do tree maintenance and shrub maintenance as well as Hedge sculpting and maintenance. In an effort to help our customers, this website was designed to answer frequently asked questions from our customers, as well as informing our customers about our company. Please read the sections of the website in which you are interested in, and we may have already answered some of your questions. 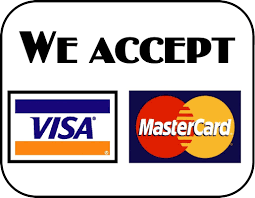 Feel free to call us with ANY questions you may have. The safest time of year to have your tree’s trimmed is in the fall or winter. Starting after the leaves start to drop and up until the spring when they start budding. Oak and Elm Trees should only be done over winter when there are no bugs to transfer diseases to or from your trees. We do tree services year round. The key to a successful business is establishing a relationship with the customer and keeping the customer informed. To start off, if a customer calls for an estimate, he/she will be given two choices. We can either schedule a time for an appointment, or, if the customer is too busy, we can give an estimate w/o them being present if they can appropriately describe the scope of the work. All calls will be answered or returned & we show up for all scheduled estimates. Due to weather conditions, a job may need to be postponed, so, the customer will be notified as soon as possible. If electric has to be temporarily disconnected in order to safely perform the work, it will be scheduled by us and the customer will be notified as to when the power outage will occur and an approximate time will be given as to when we feel it will get restored. As such, if digger’s hotline needs to be notified, it will be scheduled by us as well. You should also feel comfortable in knowing that the owner of A New Leaf Tree Service does 100% of the estimating and scheduling of all work. The foreman of the tree crew is responsible for reviewing the job with the customer before starting. Then, the crew will know exactly what the customer wants to achieve and what the customer’s concerns are. Communication between the tree crew and the customer is essential. Repeat customer’s and referrals are of the utmost importance to us. All of our equipment is newer & equipped with all of the latest safety features. Employees are trained to know that getting a job done in an efficient manner is good. However, getting it done safely is essential. We will take the time needed to get the job done right, as well as safe. Employees are taught to leave a job site so that it looks as good, if not better than when they arrived. They are to treat the property as if it were their own. 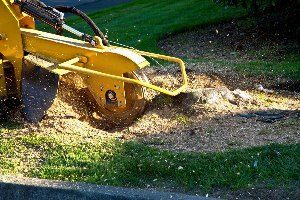 Sometimes, lawn damage can be un-avoidable (large tree removal, stump removal, time of year, etc.). But, a lot has been invested in our company to provide equipment that minimizes lawn damage. The foreman in charge of removing the tree has quite a bit to do with minimizing lawn damage, as well. Whenever possible, the foreman will exercise these skills. Whether you are building a new home, adding an addition to your home, installing a driveway, or building a garage, you should have a strategy for limiting damage to the surrounding trees. Advanced planning can reduce the amount of damage done from soil compaction and mechanical damage. 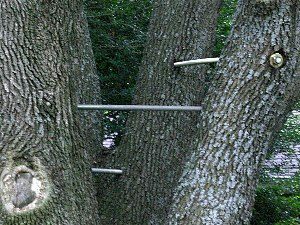 Even the healthiest trees can fail, but our experienced arborists are well trained in recognizing some of the subtle signs associated with tree failure. On too many occasions, we have noticed that property damage & personal injury could have been avoided. To do so, the customer would have had to have the knowledge of the hazardous tree on their property. That’s where one of our assessments would have come in handy. Do you have some storm damage & need a quick appraisal for your insurance company? We give free appraisals & can usually get your appraisal to you on the same day. 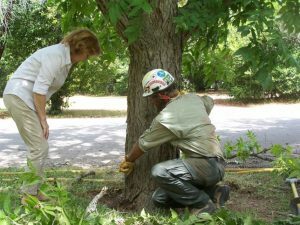 Sometimes certain circumstances can arise in which you may need to know the value of a tree on your property. Tree valuations can serve many purposes. We are here to help you determine that value. Have you ever had the trees on your entire property evaluated? Whether it’s to determine if there are any hazardous trees on your property or to see if there is any basic tree maintenance needed, give us a call or click here for a free estimate. 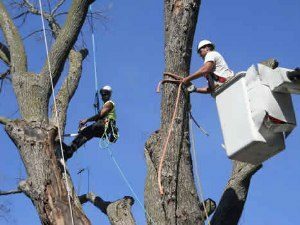 Tree removal is not a service we like to emphasize, but it is a very necessary part of arboriculture and one that A New Leaf Tree Service executes professionally and safely. Our goal is and has always been, to provide services that keep trees healthy, but there are instances when removal is the best alternative for the landscape and homeowner. We just wanted to take the time to say thank you for the great work you guys did. Your team was very efficient & the clean up was fantastic… We will be sure to share your name with our friends & family! Thanks again. Drew F – Menomonee Falls, WI. Thank you for the excellent work your crew performed at our two properties. It’s refreshing to do business with a contractor who values customer service! We will keep you in mind for future work & refer you to friends & neighbors. Jean S – Franklin, WI.